We're a few days into the new year now and I thought it would be interesting to take a look back at 2015 as well as set some goals for this new year. I'm not one for new years resolutions, instead I like to have a few things in mind that I wouldn't mind achieving in the year. Passing my driving test - This is definitely one of the main stand outs of 2015. Although I started to learn to drive in 2014 I actually ended up passing my test; first time, in 2015. It took me a while to actually want to learn to drive but after I finished University the time finally felt right. It was something I was nervous about and at time was something I didn't think I was going to be able to do but the fact that i've done it feels like a massive achievement. It has given me a huge confidence boost and helped prove that if I want to do something I can achieve it. Travelling - This year we went to Canada and America. It was a huge trip that had four different stops along the way. Starting in Toronto then going onto Niagara Falls, getting a long train ride to New York and finishing in Washington DC. I love going to America and it was so fun to tick off some bucket lists place in one trip and get to go back to New York which is definitely one of my favourite cities. Working - 2015 marked my first full year out of education which meant heading fully into the working world. I've done a few things throughout the year from freelance blogging, social media bits and finishing the year working full time in retail. It's been exciting adjusting to this but I can already see that i've changed and becoming more confident in myself and my abilities from it. Independence - I think this fits in with the previous points. Both driving and working as made me feel more responsible for myself then ever before and given me more freedom. I feel I can do more on my own and have therefore felt my independent. Blogging - This year I feel like i've found what i'm good at and what I enjoy in blogging. I feel i've found my voice and style, as well as doing some more lifestyle themed posts. Being healthy - At the start of the year I made a goal to eat better and workout more. I feel happy to say that i've stuck to this well. I feel fitter for it and have learnt more about nutrition as well as listening to what my body needs. Travel more - I doubt the will ever be a year where I don't want to do more travelling. It's a big part of my life and something I get so much enjoyment out of. I have a big list of places I want to visit and I hope to be able to tick a few of those off the list this year. Continue previous goals - I definitely want to look at what I achieved in 2015 and keep at those goals. Sticking to a healthy lifestyle and being happy through finding more independence are things that I will definitely be carrying on this year. Do more - This is a phrase that is firmly in my mind right now. I want to apply it to everything I do and to make every minute count. I'm feeling productive and want to achieve and do as much as I can. 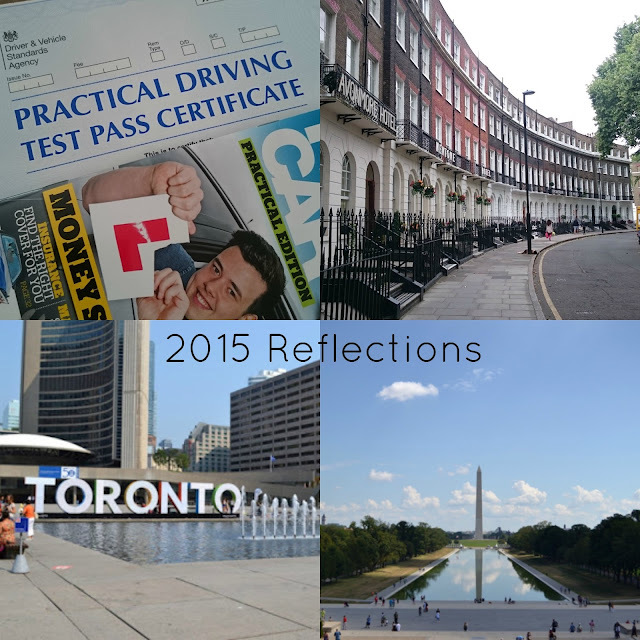 So that is a brief look back at 2015 as well as some things that I plan on doing this year. I don't like to set myself huge resolutions that will only last a couple of weeks, but I do have some things to focus on which are achievable. What have been your highlights of 2015 as well as your goals for this year?